This is a smaller port located on the island of Java and known for its fishing industry. Tourists usually only stop here on their way to visit the nearby Bromo-Tengger-Semeru National Park. The Mount Bromo national park is a volcanic complex of five volcanoes including a new caldera forming within an ancient old caldera nearly six miles in diameter. Mount Bromo stands some 7,850 feet and is Indonesia’s highest mountain and best-known volcano in the Tengger chain. During the 19th century, under the Dutch East Indies colonial administration Probolinggo, was a lucrative regional center for refining and exporting sugar, and remains an important product today. Today it is also famous for Mangoes, rice and grapes. The weather was extremely hot and humid and our tour this morning was called Probolinggo Highlights. This is a tender port, meaning that we were required to anchor offshore and take a small tender boat to shore. Our first stop was at the City Square that is more like a central park with a large lawn area for sports or civic activities. Next to the lawn area is a large park area with many trees and birdhouses for the pigeons. This area also has many food stands where people can enjoy some local cuisine. We then took Pedi cabs to the Red Church, built in 1862 by the Dutch, with a bible inside that dates back to the 16th century. 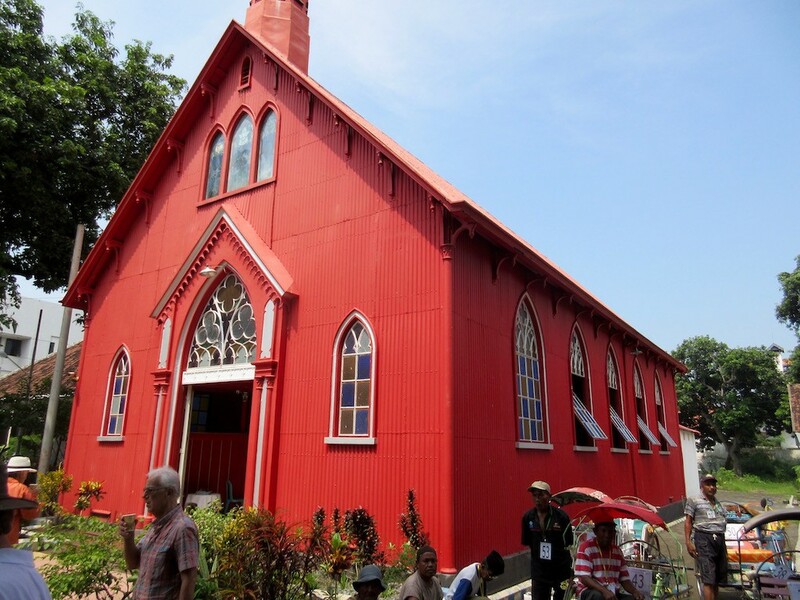 This Catholic Church is constructed of bright red corrugated steel and is very minimally decorated inside. 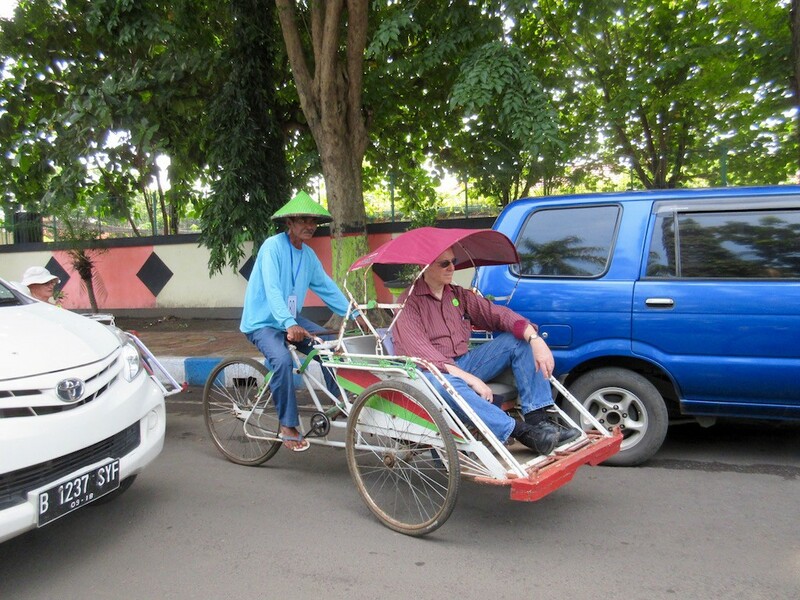 The Pedi-cabs then took us to the Probolinggo Museum to watch a traditional dance demonstration and enjoy some of the local sweets. The dances were quite simple in steps but some of the participants wore elaborate headdresses with peacock feathers. The museum is fairly small but had some displays of local dress, modes of transportation, bicycles, an airplane, some agricultural equipment, weapons, houses and some information on the area. Next the Pedi-cabs took us to the local market called Pasar Baru, which is very dark under a roof of corrugated steel. The tiny winding walk ways through the market lead you to small stands of fresh fruits, fish, chicken, baskets, flowers, vegetables and many other items. There was no refrigeration and things looked very primitive. We then went to a local batik workshop, known for creating designs incorporating the local mangoes and grapes for which Probolinggo is famous. Mark was able to create his own small batik print in the short thirty minutes or so that we were there. They showed us how they apply the wax to the muslin fabric, dye the cloth and then remove the wax. They also had a small shop where you could purchase their batik fabrics. 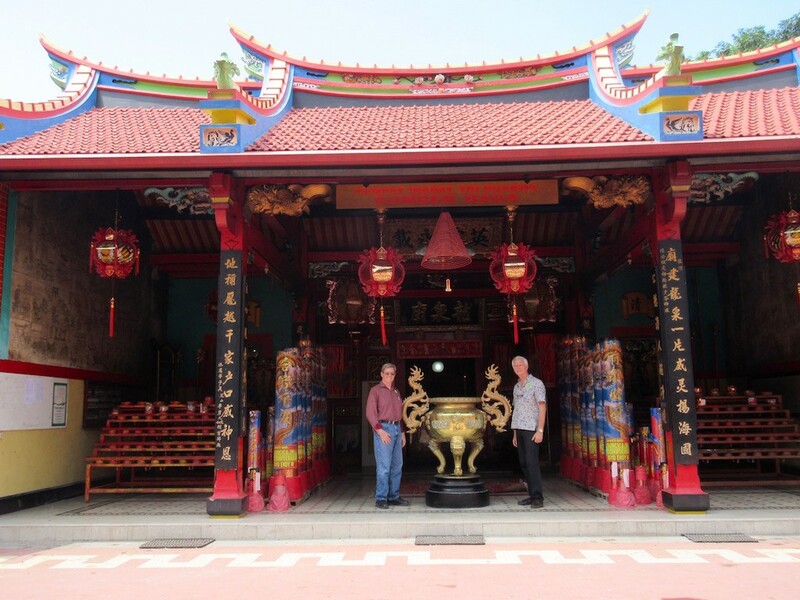 Our last stop was at the Tri Dharma Sumbernaga Chinese Temple built over 145 years ago. The temple is built in a very ornate Chinese building style. This is the center of activity during the Chinese New Year celebrations and the Chinese Cultural Parade. This temple is still used today for religious ceremonies. Since this is not much of a tourist town, the locals are not used to seeing foreigners. Many people wanted to take pictures of us or to have a photo taken with them. In the local market, our guide commented that many of the ladies were talking about how long our noses were compared to theirs. They have very flat noses so all of these Europeans and Americans had very large prominent noses to them. The people were extremely friendly, smiling and waving as we transited the city from place to place. It is a very simple town with mostly modest housing, but is was fairly clean and well maintained. On the way back to the ship, Mark noticed his room key was missing and made a stop to get it replaced at the Front Desk. All is well. The evening’s entertainment was a variety show featuring the comedian Tom Sutton and the Japanese violinists called String Idols.